If you’ve been blogging on Blogger, one common issue that you may experience is the number of posts per page not working correctly. Though you can set the number of posts per page in your blog settings, but sometimes Blogger will just ignore the settings. In early 2010, Google has introduced auto pagination in Blogger with the purpose to improve page loading speed. Auto pagination will auto determines the best number of posts per page for your blog and will reduce the number of posts per page if it detects your page loading speed is slow. 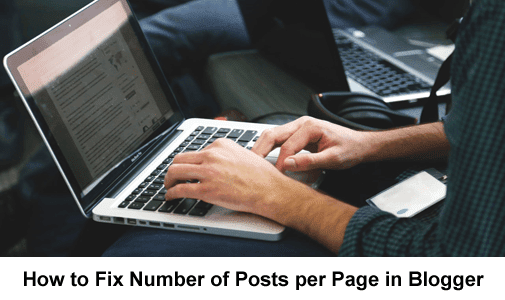 For example, if you’ve set the number of posts per page to 8 but you are only seeing 7 posts per page, then very likely your blog is affected by auto pagination. We’ll talk about the factors that cause auto pagination in Blogger and the ways to fix it. Having a long post will affect the loading time of your blog and we should always use Jump Break (Read more) in Blogger to just display a portion of the post, an excerpt on the index pages. Do note that Jump Break has no effect of text display for single post page and it is only used on the homepage / index pages. Here’s how to use Jump Break in Blogger. Jump Break is usually placed after the first paragraph of your post. To insert Jump Break in your post, move your current cursor position to the end of your first paragraph, then click on the insert jump break icon at the top (beside the smiley icon). Click Publish if you are posting a new post or Update for modifying an existing post. Images in large sizes and uncompressed type will take longer time to load. You should always use the appropriate image size and compress the images before you use them in your post. We recommend using software like Photoshop, GIMP or online services like https://tinypng.com/ to optimize your images. Having too many widgets installed on your blog will also impact your blog loading time. Try removing unnecessary widgets from your blog as some widgets might cause problems to your page. By now you should’ve learned what auto pagination is and how to fix number of posts per page in Blogger. You may also check our article on improving page speed to learn more about page optimization.